To keep the price of the system low (although the system launched in the same month as the Sega Genesis and cost $10 more), NEC cut a couple of corners with the TurboGrafx-16’s hardware. Along with the inclusion of only one controller port, the TurboGrafx-16 could only output an RF signal unless the user purchased a separate add-on called the “Turbo Booster”. This device replaced the large expansion port cover on the back of the system with an even larger piece of plastic that had stereo AV jacks on the back. Partly because they are uncommon and partly because no one wants to use RF cables anymore, Turbo Boosters have become a sought-after and somewhat pricey item, having recently sold on eBay for $50 or more. 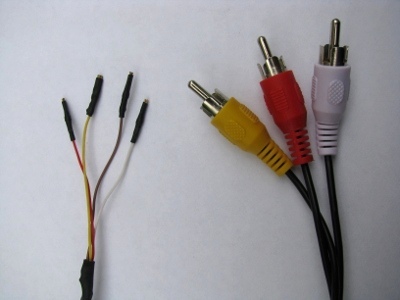 If you want to buy a Turbo Booster to have as part of your collection then that’s fine, but if you just want composite video and stereo sound out of your machine, you can build a cable that will do the same job for around $6-10 in parts, assuming that you already have the proper tools. The Japanese PC Engine’s expansion port has the exact same pinouts, so this cable is also compatible with that console. These days, you can of course just buy an aftermarket cable to do the exact same thing, but if you’re anything like me then you want something right now, rather than having to wait for it to arrive in the mail. Some of the items aren’t absolutely necessary, but the quality of the cable depends on the supplies that you use. It is entirely possible to make this cable without soldering anything, but it will be much more fragile. Similarly, you can use electrical tape instead of heat shrink but the quality of the cable will suffer. How much you pay for the parts really depends on where you go and what your options are. If you have an electronics supply store nearby then you’re going to want to go there to get the best price. Otherwise you are probably stuck with the ubiquitous Radio Shack. The easiest way to get the pin connectors is to buy a 25-pin female D-sub connector with crimp-style connectors from Radio Shack (cat. no. 276-1430), which costs $3 and comes with 25 pin connectors. [2015 edit: Radio Shack has closed a large number of its stores, so you may have a harder time finding parts unless you have another electronics parts store in your area.] If you don’t have any heat shrink you can pick some up here as well. You need some 1/8″ or 3/32″ and 1/4″. Radio Shack sells little variety packs for about $4, so just grab one of those. While you’re at the Shack you may be tempted to just buy an AV cable there, but they charge $13 for a 6-footer. You can easily find such a cable at any thrift store for less than $1 if you don’t already have one laying around the house. If you have the option of going to an electronics supply store instead of Radio Shack, you should just be able to buy the pin connectors by themselves, and can buy 3′ lengths of heat shrink in the sizes specified for about $2 each. In my toolbox I have fine gauge wire that I harvested from old serial and parallel cables. If you don’t have any, I would recommend grabbing such a cable at the thrift store (especially if you are already going over there to buy an AV cable) and cutting it open to take out the wires inside. If you are going to be doing any DIY electronics projects in the future (like console or controller modification) then you’re going to need it anyway. You can buy a spool of it at the store, but by taking it out of an old computer cable you get an ample amount of wires of varying colors, which is both handy and cheaper than buying it by the spool. Once you have your supplies in order, you can start building the cable. The first thing you need to do is to cut off one end of the AV cable. Where you cut it depends on how long you want your finished cable to be. In any case, once the cable is cut slip a ~1″ piece of the 1/4″ heat shrink onto the cable and push it down far enough that it will be out of your way for now. Then separate the three wires so that each one is about 3 inches long. Carefully strip the 3″ length of each wire using your wire strippers and you should see coiled bare copper wire underneath. This is the shielding/ground wire and should not be cut off. Carefully unwrap it from the inner wire, which should be colored based on the signal that it carries (yellow, red, or white). Strip about 1/4″ of the inner signal wire and then slide it into the back end of one of the crimp connectors. The bare wire should partially disappear into the connector, and the crimp-on portion of the connector should have wire in it that still has the plastic housing on it. Carefully squeeze the tabs together from the top using your wire cutters or a pair of needle-nose pliers. If you squeeze them together from underneath, the wire may pop out from between the tabs. If you have a soldering iron, you can put a dab of solder on the still-visible portion of bare wire to ensure a proper connection, but it isn’t necessary. Repeat the procedure with the other two signal wires. Strip all three wires, and unwrap the shielding wire from the signal wire. Twist all of the ground wires together and cut them down to about 1/2″. 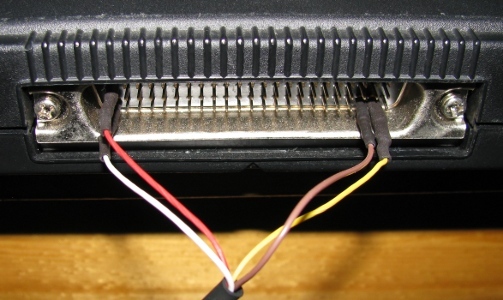 Put crimp connectors on the end of all three signal wires and then squeeze them with some pliers to create a tighter connection with the pins on the TurboGrafx. You should still have a bundle of bare copper wire sticking our from each wire. Carefully gather them all together into one bunch and twist them into one strand, being careful not to break them. What you are doing is tying all three ground lines together. Once they are twisted together, cut the wire so that only about 1/2″ of it remains. Cut a ~3″ length of fine-gauge wire and strip about 1/4″ off of one end, and attach a crimp connector to it just as you did with the other three wires. You need to attach the other end of this wire to the ground wires that you just tied together. If you have a soldering iron, strip about 1/2″ of the end of the wire and just solder it to the ground wires. If you don’t have a soldering iron you can bend both wires into hooks, loop them together, and then carefully twist the wires to tighten the connection. This will work but you’ll have to be careful not to pull on the ground wire when using the cable, as the union that you just created won’t have much strength. Now you just need to add the heat shrink tubing. Slide the piece that you already put on the AV cable up to the point where you cut the cable. Center it over the cut point and shrink it into place using your lighter or match. Move the flame around the tubing on all sides, but don’t leave the flame in one place for any length of time. After a couple of seconds, the tubing should be shrunk into place and should now fit tightly over the cable. Next, cut the 1/8″ tubing into four 1/2″ segments and slide one over each pin connector. The end of the connector should just barely be peeking out. The heat shrink is going to protect the joint between the connector and wire, prevent the connector from accidentally making contact with adjacent pins on the TG16 expansion port, and will squeeze the connector together to create a tighter fit. Once again, hit these with a flame to shrink them up, and your cable should be finished! If you did everything correctly, your finished cable should look something like this. The expansion port on the back of the console has 69 pins, but we’re only interested in 4 of them. R, L, and V are the right and left sound channels and the video signal, respectively. The 5 G’s are all ground, and it doesn’t matter which ground pin you use. Push your connectors over the pins as far as they will go. Be careful not to bend the pins, as the expansion post is used to interface the TurboGrafx-16 with the CD-ROM attachment. If the connectors do not fit snugly, take them off and squeeze them a little bit with a pair of pliers. Once you have your cable attached to the console, plug it into the TV and fire it up with a game in the system. If you did everything correctly you should see and hear your game. Schematic of the TG16’s expansion port, showing the pins needed for a stereo AV signal. R is the right audio channel, L is the left audio channel, V is the video signal, and G is ground. The only downside to this cable is that you can’t use it with the expansion port cover in place, but that’s a small price to pay for composite video and stereo sound that doesn’t cost an arm and a leg. The cable is also somewhat fragile, so be careful not to jerk on it and always unplug it by grabbing each pin by the heat shrink and carefully pulling it out. The home-made cable plugged into the TurboGrafx’ expansion port. If you run into any problems or have any questions, you can always drop us a line via the “Contact Us” link at the top of every page. Tagged AV Cable, Composite Cable, How to, PC Engine, Stereo, Turbo Booster, turbografx-16. Bookmark the permalink.